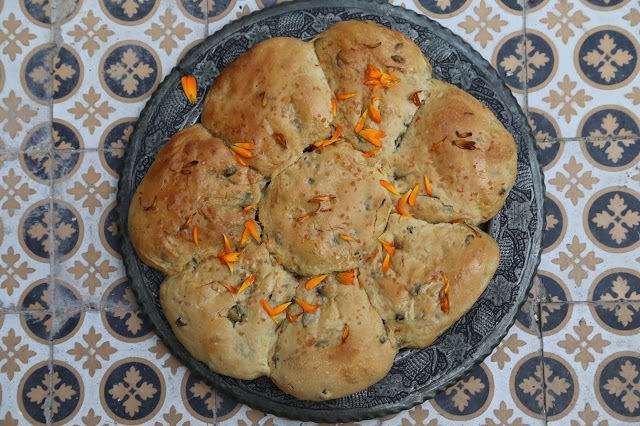 I baked this for my edible flower supper club recently. It didn’t last long – guests devoured it. A word about flour. Mostly, one uses strong bread flour with high protein to make bread. Most Italians use tipo 00 flour to make focaccia which gives a fine light texture, a bit like an Aero chocolate bar, and a golden colour. Be aware however that there are several types of 00 flour: the 00 refers only to the grind, i.e. very fine. Look at the protein on the packet and choose a high protein 00 flour, it can range from 6º to 12.5º. 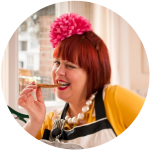 Up to 10º, use it for pasta, over 10º, use it for pizza bases, Italian breads and focaccia. More protein, more gluten. Sorry coeliacs but love me some gluten. Marigolds are the basis for calendula, the cream which is very good for your skin. Regarding the pumpkins seeds and oil, obviously the very best is from Austria, Styria but ordinary pumpkins seeds and oil will do fine. Prep time: 30 minutes plus rising plus 30 minutes baking time. Mix the water, the honey and the water separately. Leave to froth. Then mix everything together, add the semolina, marigold petals, pumpkin oil and seeds. Knead for ten minutes. Leave in an oiled bowl covered with cling film to rise for one hour or leave it overnight in the fridge to rise slowly. Then tip the dough carefully out onto a floured surface and cut the dough into 8 pieces. One will be the centre and the other 7 will be shaped, delicately by pinching, as petals. Join the petals to the centre round and using a sharp knife slash the shape of the flower as above. 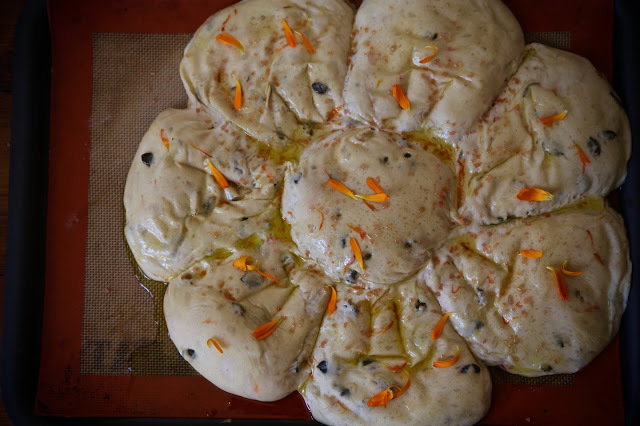 Place the dough flower onto a silpat or parchment paper on a flat baking tray. Preheat the oven to 200ºc. Leave to rise for another half an hour then bake in the oven for 30 minutes. Remove from the oven, scatter marigold petals over the top, the red salt and drizzle over some more pumpkin seed oil. Thanks for the tip about the 00! I didn't know that.